Looking for permanent side walls to protect your ATV or UTV? Our APT line of trailers has just that. With additional features like full-length, adjustable tie-downs and 15” tires, you can be sure every detail has been crafted to meet the unique needs of ATV, UTV or combination hauling. Take a look at some additional features below, and be sure to request a quote from your dealer when you find the model you’re looking for. Custom engineered aluminum extrusions provide for a higher level of fit and finish. A-frame tongue design provides added support and effortless towing for those heavier loads. Custom designed side rails with integrated tie down system provide unlimited tie down flexibility. Welded aluminum side kit is standard, providing excellent containment of your loads. Wood plank deck with durable red pine select quality boards for durability and strength. Tough molded plastic fenders are bolted to aluminum frame supports to reduce noise and provide convenient frame supported steps. Integrated tie down system utilizes the full deck length for unlimited tie down flexibility. Four cord rubber torsion axle with independent suspension provides a smooth ride. LED lights installed with rubber grommets reduces vibration and protects them from the elements. Custom molded wiring harness, routed through the trailer frame, keeps your wiring protected from the elements. Easy to use Bearing Lube system provides superior lubrication and long bearing life. Quality 2" coupler with steel safety chains and spring loaded clips for ease of use, strength and safety when you need it the most. A swivel wheel tongue jack makes it easier to move the trailer off the hitch and also keeps the tongue off the ground. Tall 21 1/2" welded aluminum sides. Tire Upgrade Options: ST205/75D15C ALUM. Shown with options. Make sure that the trailer has the carrying capacity and deck space for your specific loads. Recommended tongue weight 7-10% of GVWR. Upgraded tires will change deck heights. Some tire upgrades require spacer kits. See your dealer. It is the responsibility of the purchaser to adhere to the brake laws regarding trailers. For full information on the laws in your state, contact the appropriate State Motor Vehicle Dept. 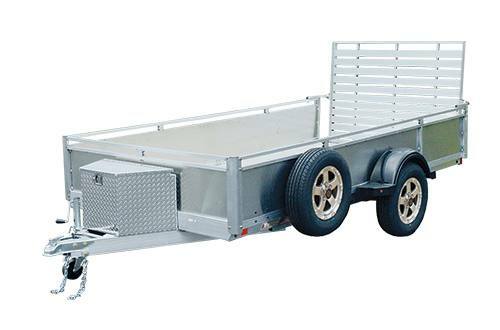 Contact your authorized Triton Trailers, LLC dealer for specifications, pricing and lead times. Due to continuous product improvements; standard features, optional accessories and specifications are subject to change without notice or obligation. Triton Trailers, LLC reserves the right to make changes to models or discontinue models without notice or obligation. *Brake options will change the overall length of trailer. Second axle brakes can be added when one is standard. w/o Brakes: 2290 lb. ; w/Brakes: 2795 lb. w/o Brakes: 2995 lb. ; w/Brakes: 3500 lb.